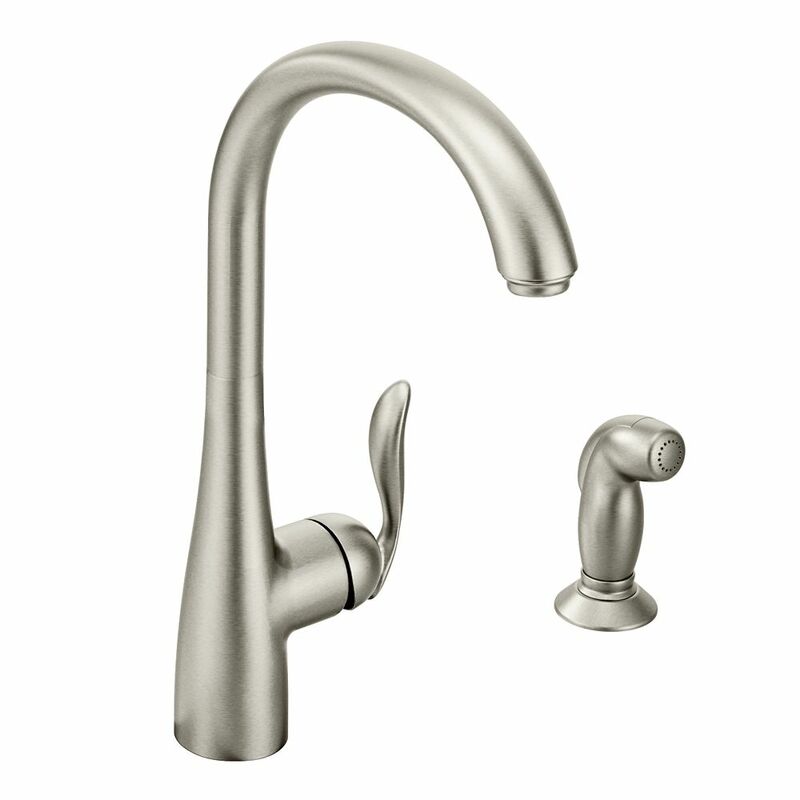 MOEN's Arbor line of kitchen faucets delivers streamlined functionality and timeless transitional styling. With smooth, graceful curves extending into a high-arc spout, the Arbor Standard Kitchen Faucet features a single-lever design for easy, one-handed use and comes complete with a side sprayer that allows for flexible cleaning around the sink basin. Style meets functionality in the Essie Pull-Down Sprayer Kitchen Faucet from MOEN, boasting transitional design appeal while showcasing several of MOEN's top innovative features. Essie utilizes Reflex technology, engineered specifically for pull-out and pull-down movement by undocking easily, moving with you and retracting effortlessly when you're done. Also designed with Power clean technology that delivers 50% more spray power than faucets without Power Clean, Essie ensures efficient washing with less effort. Inspired by soft curves and crisp edges found in nature, the Kaden Pull-Down Sprayer Kitchen Faucet infuses versatile, transitional styling into any kitchen. Showcasing MOEN's top innovative features, Kaden utilizes Reflex technology, engineered specifically for pull-out and pull-down movement by undocking easily, moving with you and retracting effortlessly when you're done. The Reflex system was developed in a kitchen just like yours, by observing peoples' routines to create an effortless experience that simplifies daily tasks. Also designed with Powerclean technology that delivers 50 percent more spray power, Kaden ensures efficient washing with less effort. Unique architectural elements can make a room come alive, and the Notch Kitchen Faucet presents the form and function to create such a focal point with confidence. This pull-down faucet collection from MOEN offers dual-flow functionality and features a 450 slant of the handle that lends a unique presence with gentle curves. Notch also utilizes Reflex technology, a comprehensive system of design enhancements engineered specifically for pull-out and pull-down movement by undocking easily, moving with you and retracting effortlessly when you're done. Arbor Single-Handle High-Arc Standard Kitchen Faucet In Spot Resist Stainless MOEN's Arbor line of kitchen faucets delivers streamlined functionality and timeless transitional styling. With smooth, graceful curves extending into a high-arc spout, the Arbor Standard Kitchen Faucet features a single-lever design for easy, one-handed use and comes complete with a side sprayer that allows for flexible cleaning around the sink basin. Arbor Single-Handle High-Arc Standard Kitchen Faucet In Spot Resist Stainless is rated 4.2 out of 5 by 28. Rated 4 out of 5 by Idaholady from I love the style; however, this didn't fit our sink configuration -- my fault, not Moen's or Home... I love the style; however, this didn't fit our sink configuration -- my fault, not Moen's or Home Depot. I had to return for a Moen Declo which works wonderfully. I was really sorry this didn't work. Rated 3 out of 5 by DT from The nozzle on the end of the faucet sprays all... The nozzle on the end of the faucet sprays all over (not sure if it is defective or bad engineering). I will go to a hardware store to see if I can replace somehow. Rated 5 out of 5 by JazzyJan from Sleek and graceful curving lines. Well-made. Simple to maneuver between... Sleek and graceful curving lines. Well-made. Simple to maneuver between hot and cold. Brushed stainless shows no fingerprints. Very happy with this choice out of so many kitchen faucets to choose from. Rated 5 out of 5 by Gale from this product The Arbor High-Arc single- handle kitchen faucet fit the sink perfectly. It install... this product The Arbor High-Arc single- handle kitchen faucet fit the sink perfectly. It installed very easy, and works just fine. I would recommend to any one that needs this type of faucet. thank you Moen !!!!! Rated 5 out of 5 by Jeremy from Very easy to install. Directions are well written. The height... Very easy to install. Directions are well written. The height of the faucet permits larger pots to be washed. Highly recommended. Rated 5 out of 5 by Susan from I ordered the new faucet because my old faucet leaked... I ordered the new faucet because my old faucet leaked and it was recommended by my plumber to get a new one. Although I have Corian countertops and three holes drilled for the original faucet it fits nicely. A little close but ok. It also is higher, which I love. Very attractive! Rated 5 out of 5 by HomeDepotCustomer from Beautiful faucet. It is more expensive than many apparently comparable... Beautiful faucet. It is more expensive than many apparently comparable faucets. The quality of the materials and the finish is head and shoulders above the others.